Growing lilies from seed is a long term project. You make your breeding crosses during the first summer, then collect and prepare the resulting seed that winter, for sowing in March of the following year. Indoor gro-lights or a heated greenhouse is a must, as only a small percentage of hybrid seed will germinate if sowed directly outdoors. 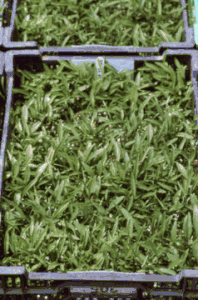 Since each seedling is unique, it can take two to five years of additional growth before a grower is able to evaluate the first flowers, and make selections for clonal (vegetative) propagation. The easiest hybrid lilies to produce are between crosses of lilies of the same type; Asiatic lily to Asiatic lily, Trumpet to Trumpet, etc. Interspecific crosses are much more difficult, but members of the North American Lily Society can provide valuable assistance if you wish to embark on this fascinating hobby. To avoid cross pollination when producing new hybrid seed of any plant, you need to strict sanitary conditions; from the collection of pollen grains produced by the father plant, to manually fertilizing the stigma of the mother plant. A serious hybridizer (plant breeder) keeps strict records of all crosses so that he/she may go back and repeat any combinations that produced desired results. For our purposes, however, we�ll start with seed that is open-pollinated, or has naturally occurred on a stem. �2005-2017, B&D Lilies, All Rights Reserved.